Is it possible to get to New York (first time across the pond!) in a powered wheelchair, with no help from friends or family who live there, and only conversational English? Yes, it is! A trip to the USA has been my dream since childhood, probably thanks to movies that were my main source of knowledge about America. But first things first. How did it happen that I finally landed in New York? As a Polish citizen, I needed a visa. Living in Poland, I’ve heard many times that getting one is nearly impossible. Everybody here knows the American government still assumes that every Pole who wants to go to the US, plans to stay and work there. Nowadays, this sounds absurd. Something must have changed in Poland over the last decades, right? The USA is no longer a paradise for Poles, where earnings are several dozen times bigger. But let’s get to the point. I live in Sweden, and, although I still am a Polish citizen, I chose the American Embassy in Stockholm as my visa battle ground. At first I had to fill in a long form and attach my picture via the Internet. Obviously, the form was in English. I had to pay right away, and this is when a small problem came up – the system didn’t accept Visa cards, and the account number was given in a weird format. After a longer search I managed to find a “normal” account number and transfer the amount due. In theory, you schedule an appointment for a specific time online. In practice, you wait in a line after you arrive on that time. Entering the embassy is like entering a fortress. At the gate, which looks more like a small building, security control is more thorough that at an airport. First, baggage check, then scanner. I even had to drink some of the water I was carrying cause it could be something dangerous. It was a nightmare. The interview was short and sweet, and hardly any of the questions I’d read about earlier appeared. I was asked where we work, how long we’ve lived in Sweden, and where and how long we are going to stay in the US. I left my passport in the embassy and, three days later, it was waiting for me in my mailbox with my visa stamped inside. Wow! One of my dreams had just come true! Using my broken English, I carried out all of the preparations for the trip via the Internet. I have to admit, you can find all the information you need about availability or accessibility of particular places there. I was a little anxious about the length of the flight, unnecessarily, as it turned out. The seats were very comfortable and quite different form those in short distance planes, used, for example, in Europe. At the airport in New York, I was pleasantly surprised by the service. The attendants introduced themselves and asked if they can be of any assistance. My wheelchair was swiftly carried into the jet bridge. We landed at Newark-Liberty International Airport, which lies outside of the city, but getting to Manhattan isn’t trouble at all. When they see someone heading to the station or hanging around the ticket machines, the attendants react immediately and kindly direct you towards your platform. When the train arrives, an attendant takes out special ramp used for wheelchair access. During disembarking the conductor makes sure it is spread out. 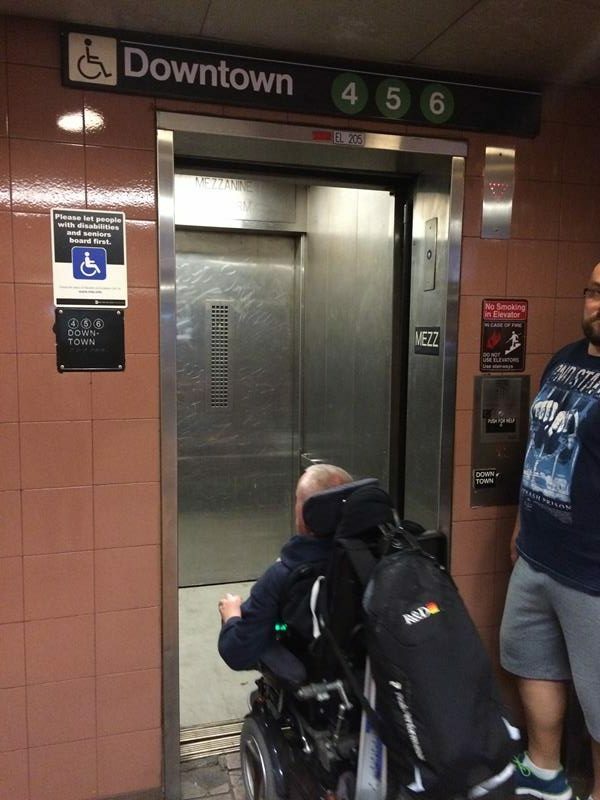 So, getting from the airport to the center of New York is not a problem even in a wheelchair. But what next? I’m joking, of course – our hotel was booked a month ago, and the transport checked out beforehand. 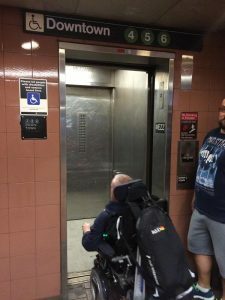 Unfortunately, the subway is only partially wheelchair-accessible, but I think it is sufficient to get around the city with no great discomfort. The subway is terribly big, and has 468 stations, probably one in five of which is wheelchair-accessible, but all of the major stops are for sure. Maps with marked accessible stations are on the walls of all of them, as well as on the subway’s website. Additionally, all the wheelchair-accessible stations are thoroughly described on the Web. Boarding spots on the platforms are marked, too. They are slightly elevated, which makes boarding perfectly smooth. Summing up, I find NY subway well-marked and really functional. 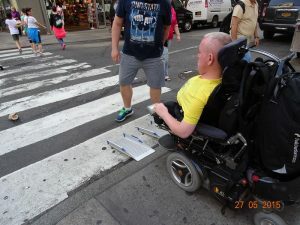 It is interesting that nearly all buses in New York are accessible, meaning they use wheelchair lifts. I think it is really great, although I haven’t had a chance to use one yet. But I’ve traveled in wheelchair-accessible taxis: they are the normal yellow ones. Apparently, there is a lot of them around, but when I ordered one in Manhattan at night, I had to wait for more than an hour. One of the locals told me that it’s normal in New York. I have to admit that using a wheelchair in the street is pretty tiring. The sidewalks are often damaged, and the crosswalks are ridiculously full of holes. Plus road works and scaffolding are a common sight. Heavy pedestrian and road traffic doesn’t make things better, either. Sidewalk ramps near the crosswalks are usually there, though there are high curbs from time to time, and you have to either find another crosswalk, or manage it somehow, as shown in the picture. Let me write just a few words about restrooms, because this turned out to be surprising. I was first astonished when I asked about accessible toilet, and in response I heard “Hmm, good question.” Toilets for the disabled are usually just slightly bigger stalls in normal restrooms. There are no separate disabled toilets like where we live, but there are family restrooms – they are bigger and I can recommend using them. 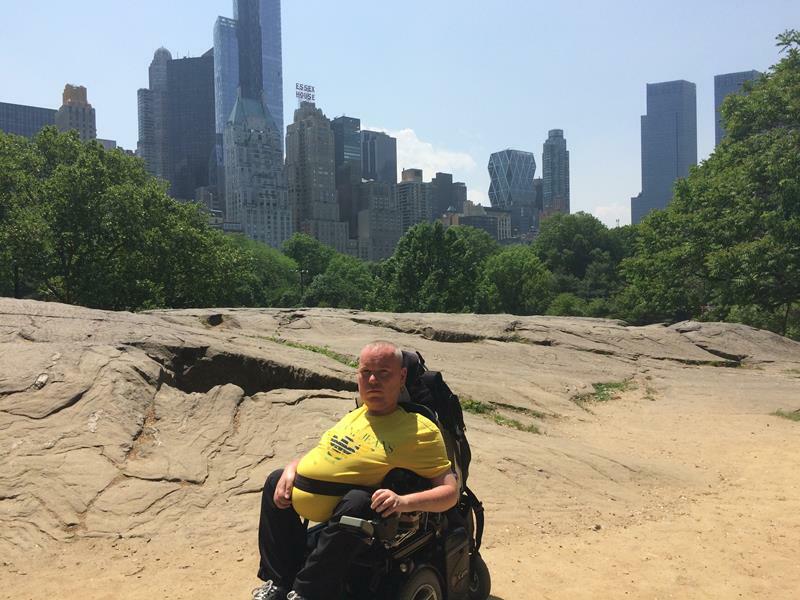 Most of New York attractions are very well-prepared and accessible for the disabled. Usually, there is someone from the staff right at the ticket counter to show you the way, so you can comfortably admire, for instance, the panorama of the New York city from the 102 floor of One World Observatory, or the charm of skyscrapers from the ferry to the Statue of Liberty. To sum up, I think that it is possible to sightsee NYC in a wheelchair with no major concern. Certainly, it is better to prepare beforehand and make a plan of your trip, and, most of all, print out important addresses, websites, or detailed maps.